Friendship comes in many colours! Take your adventure far beyond Equestria's borders with this: the first sourcebook for Tails of Equestria. 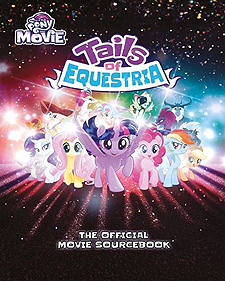 Based on MY LITTLE PONY: THE MOVIE, this book contains everything you need to bring new and exciting characters, locations, and stories to your Tails of Equestria game. Detailed descriptions of new areas outside Equestrai, such as Klugetown and Mt. Aris, and advice on how to incorporate them into your game. You can even travel underwater as a Seapony! Four new playable races: Cats, Parrots, Hippogriffs, and Lizardfolk. New rules options relating to factions, reputation, and vehicles - own and customise your own airship. A brand new adventure set outside Equestria. Join Captain Rosella's piratical quest for treasure and stop the threat of the Storm King's minions.